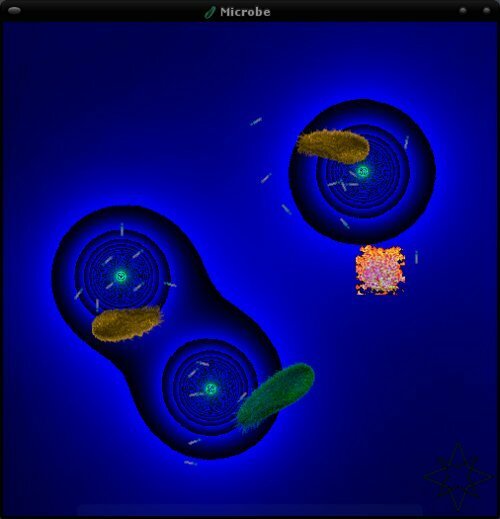 Microbe is a microbial simulation that uses biological concepts to simulate life behavior. The program experiments with ideas relating to biology, genetics, evolution, and artificial life. The program was written in Python programming language. In addition to Python 2.5 interpreter, it requires the Python modules Pygame 1.8, Numpy, and optional Psyco. To execute the source, use the command 'python microbe.py', with -h for options. Executables are also provided, which does not require Python/modules installation. Microbe is released under the GPL v3 license.